Good looking and functional, too, pouches are taking on rigid packaging. The stand-up pouch is the new can, jar and bottle. That's the thinking at companies such as Campbell Soup, Heinz and Kraft, which are transforming supermarket shelves and foodservice operations with pouches of all sizes and configurations. Pouch attributes such as light weight, ease of use, product protection and visual appeal also are attracting smaller processors, for products ranging from fresh fruit to tapenade. Campbell Soup Co., Camden, N.J., is adding pouches to its packaging lineup for two new product lines, Campbell's Go! Soup and Campbell's Skillet Sauces. The products will launch in the U.S. this summer. Both products will be packaged in retortable stand-up pouches made from customized, high-barrier laminated materials. The microwavable Go! Soup pouch material is an all-plastic laminate; the Skillet Sauces pouch is made from a plastic/aluminum laminate. Developed for a single use, the pouches are not resealable. The soup pouch holds 14 oz., and the sauce pouch holds 9 oz. Both structurally and graphically, the Go! Soup pouch will shake things up in the soup aisle and add a new dimension to Campbell's array of products in cans and rigid cups. Because U.S. consumers are not familiar with ready-to-eat soup in a pouch, Campbell will use the package graphics and structure to attract and educate consumers. "Many of the soup pouches in the marketplace contain dry products that need to be reconstituted," explains John Faulkner, Campbell's director of brand communications. "To help prevent confusing Go! Soup with dry products, we are utilizing a clear gusset on the bottom [of the] pouch to allow consumers to see the wet soup" inside the pouch. Directions on the back of the soup pouch will explain how to microwave the product, starting with tearing at the notch to vent the package. The pouch material was engineered for linear tearing, which provides clean opening and easy microwave preparation. The sauce pouch was not designed for microwave cooking but rather for pouring into a skillet and heating with chicken or other protein. Graphics created for the Go! Soup pouches are quirky and fun, featuring photos of "Millennial" men and women — people in their late teens to early 30s, that is. With the Go! Soup line, "We are targeting Millennial consumers," Faulkner says. "We know they believe that today's soup choices fail to deliver a convenient, fresh, exciting food experience. As a result, our traditional canned soups are not a part of their eating repertoire." Faulkner adds that Millennials eat "significantly fewer servings of canned soup each year" than their elders. In the Millennial demographic, "Canned foods are perceived negatively. We need to remove that negative barrier." This market insight drove the pouch's look and feel, which are so different from those of a soup can. Decorated using reverse-print rotogravure, the pouches will create colorful point-of-purchase billboards when they hits store shelves. Acknowledging the primacy of smartphones among Millennials, Campbell will print a 2D barcode on the back of each pouch. Scanning the code will bring consumers to a Campbell's website. Pouches used for multiserving products need be reclosable and, ideally, incorporate a dispensing feature. The new economy-oriented Heinz Ketchup pouch, for example, has a reclosable cap and a spout. To dispense ketchup, the consumer simply removes the cap and squeezes the flexible package. The 10-oz. stand-up pouch is decorated with Heinz's familiar graphics. The iconic white shield pops on a ground of red, and a call-out on the front of the pouch assures consumers that the product is the "Same Heinz" with a "Great Low Price." The suggested price for the pouch pack, which launched this spring, is 99 cents. The company is "leveraging this cost-effective pouch format to make Heinz Ketchup accessible to all consumers," says Tracey Parsons, a spokesperson for H.J. Heinz Co., Pittsburgh. She adds that the pouch is convenient for cooking, because the package contains the equivalent of one cup of ketchup. Artisanal processor Maison Le Grand (www.maisonlegrand.com), St.-Joseph-du-Lac, Quebec, also chose a pouch with a spout fitment for its products. The company previously used glass jars but switched to custom pouches made of multilayer, high-barrier materials for its pesto, tapenades, aromatic sauce and tzatziki. In each case, the multilayer material and spout are customized to suit the all-natural, cold-filled products' characteristics, including viscosity and sensitivity to oxygen and light. Flair Flexible Packaging (www.flairpackaging.com), Appleton, Wis., supplies the opaque pouches, which hold 170-200g (6-7 oz.). A high-density polyethylene (HDPE) spout is heat-sealed to the corner of each Maison Le Grand pouch. The spout helps reduce oxidation after the package is opened by restricting the flow of air back into the pouch. After opening, the products do need to be refrigerated. In addition to their functional attributes, the pouches make a splash on-shelf. Like Campbell's pouches, Maison Le Grand's are decorated using reverse-print rotogravure. This technique provides excellent print quality, and because the printing is on the inner side of the film's top layer, graphics and text are protected from scuffing. Convenience features are a key selling point for pouches of all kinds, including the flow-wrapped variety. A recent flow-wrap pack for Kraft Foods' Philadelphia Cream Cheese, for example, features a pressure-sensitive, resealable tab. Kraft worked with Sonoco, Hartsville, S.C., to create the package, which is sold only in Mexico. Made from a laminated, metallized, multilayer material, the 160g cream cheese package incorporates Sonoco's SmartSeal easy-open/reclose technology. The same design is used in packaging for several of Kraft's Nabisco-brand baked goods, including Oreo cookies. In addition to providing easier product access and storage, the new cream cheese package purportedly keeps the product fresher than the previous flow-wrap package. The resealable pack won a Silver Award for Technical Innovation in the 2012 Flexible Packaging Achievement Awards competition. Although it's difficult to quantify the sales effect of switching to pouches, the change has helped the company build brand awareness. "The impact for our company has been enormous," says Claudia Maciocia, Maison Le Grand's sales and marketing director. She adds, "Thanks to the packaging, we immediately stood out in our category, and the packaging offered a way for us to advertise. Catchy and immediately visible on the shelf, [the pouches] draw attention and communicate to our consumers in the few seconds that they have to make a decision. The change to Flair's stand-up pouches was undoubtedly a major turning point for Le Grand and is a major contributor to the brand recognition that we have." Pouches are gradually infiltrating the produce department, as well. Freshline Foods Ltd. (www.freshlinefoods.com), Mississauga, Ontario, has switched from rigid plastic cups to breathable stand-up pouches for various fresh fruits and vegetables, including sliced apples and root vegetables. Freshline's resealable pouches hold 400g, on average, and the pouch material is engineered with gas transmission properties suited to each product's respiration rate. "Produce is a naturally breathing item. Having a breathable bag actually helps with the shelf life," says Noel Brigido, vice president of operations at Freshline. "We can custom tailor the OTR [oxygen transmission rate] to the product" to achieve the proper respiration rate. Compared with rigid cups, the pouches extend the products' shelf life by about 20 percent, Brigido says, but notes that this percentage is a "great average. Some have been upwards of 40 percent," while others are already at, or near, maximum shelf life in the cups. In addition to helping with shelf life, Freshline's pouches provide merchandising and consumer benefits. The sliced-apple pouch, for example, has a transparent window to showcase the product, and its colorful, high-end graphics are superior to those on rigid produce packs. Plus, the pouch makes a convenient snack pack and fits into a consumer's refrigerator more easily than a cup. Switching to premade pouches also made sense operationally. Brigido reports that rigid cups take up five times more space than pouches; therefore, with the pouches, transportation-related greenhouse gas emissions are lower and Freshline can use its warehouse space more efficiently. In the foodservice market, demand for ease of use and improved yield are pushing brand owners to get more creative with pouch designs. Earlier this year, Kraft Foodservice (www.kraftfoodservice.com), Glenview, Ill., introduced an innovation called the Kraft YES Pack for foodservice operations ranging from college cafeterias to fine-dining restaurants. The squared-off pouch, designed with dual handles and a rigid plastic mouth, holds one gallon of salad dressing. The package is made of a high-strength, flexible nylon-polyethylene blend film. The Kraft YES Pack was developed to replace traditional rigid one-gallon jugs, says Barbara Pritikin, senior manager of Kraft Foodservice, Integrated Marketing Communications. "Its design is based on ... operator needs for increased yield, ease of use and sustainability," the three benefits to which the YES acronym alludes. The yield benefit, which Kraft quantifies as an extra 2 oz. of dressing per two-pouch case, is a function of the package's squeezability. According to Kraft, kitchen workers can dispense up to 99 percent of the product from the pouch. Product handling is where the "ease" comes in. The pouch's handles provide a controlled, accurate pour and easy carrying. As a side benefit, the mess of scraping residual dressing out of a jug is eliminated. With regard to sustainability, Kraft reports that transporting the pouch film generates 70 percent fewer carbon dioxide (greenhouse gas) emissions than transporting rigid jugs, and the pouches require 50 percent less energy to manufacture. Currently, Kraft offers eight dressings in the YES Pack, and the pouch is piquing foodservice operators' interest. Pritikin says they're attracted to the package design, and when they hear about its yield, ease and sustainability features, they "often ask why someone did not introduce this type of concept sooner." 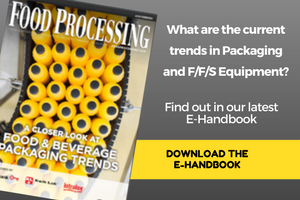 Flexible packaging formats continue to take the day for an array of foods and beverages. Peek-a-boo packaging lets your product tell the story.